June 7, 2016 – Cobham’s Magnetoresistive Random-Access Memories (MRAMs) launched aboard the ExoMars Trace Gas Orbiter (TGO), on March 14, 2016. The MRAMs are used by the Nadir and Occultation for MArs Discovery (NOMAD) instrument on the TGO to record data. The ExoMars program is a joint endeavour between the European Space Agency (ESA) and the Russian Federal Space Agency (Roscosmos). 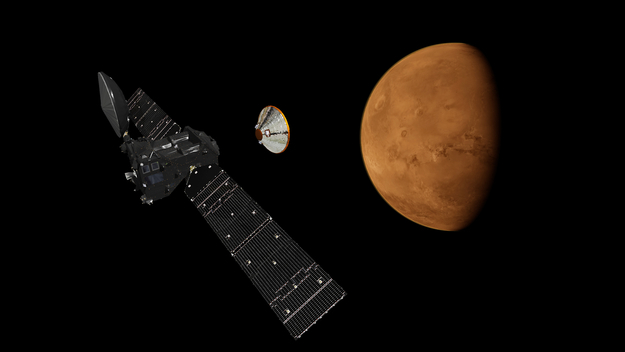 The first mission of the ExoMars program is ExoMars 2016. It is scheduled to arrive at Mars in October 2016 and consists of a Trace Gas Orbiter (TGO) and an entry, descent and landing demonstrator module (EDM) known as Schiaparelli. The main objectives of this mission are to search for evidence of methane and other trace atmospheric gases that could be signatures of active biological or geological processes. 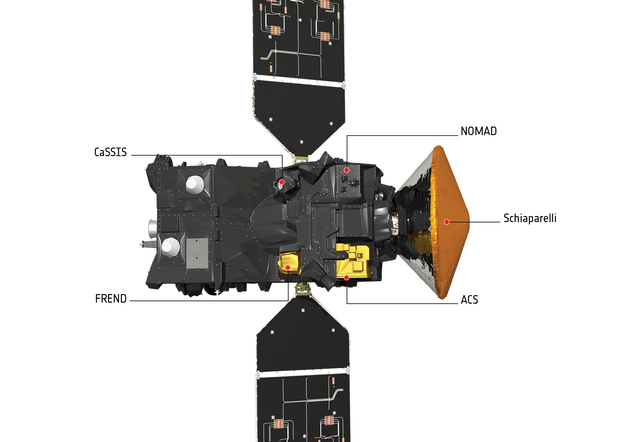 With a science payload of four instruments, the TGO will investigate the gases that are present in small concentrations in the atmosphere – making up less than 1 per cent of it. NOMAD is a spectrometer suite that will cover the ultraviolet, visible and infrared ranges, operating in solar occultation, limb and nadir-viewing modes. The wide spectral range will enable the detection of the components of the Martian atmosphere, even in low concentrations, and will generate a huge dataset. Cobham MRAMs were chosen due to the part’s access time, data retention and footprint, as well as radiation performance. Cobham’s Semiconductor Solutions business unit, part of the Cobham Advanced Electronic Solutions sector, provided the MRAMs to the Instituto de Astrofisica de Andalucia (IAA) and the Belgian Institute for Space Aeronomy (BIRA-IASB). Five MRAMs were integrated on an interface board on the instrument. IAA confirmed in April that the board was powered on during flight and the MRAMs are working properly. “Cobham extends our sincere thanks to IAA, BIRA-IASB and ESA, along with our congratulations on a successful design, launch and mission,” said Jeff Hassannia, Senior Vice-President of Business Development and Technology for Cobham Advanced Electronic Solutions. Cobham Semiconductor Solutions is a global supplier of Standard HiRel ICs including memory, μprocessor, interconnect & power and ASICs for space, commercial, medical and industrial markets, along with Electronic Manufacturing Services (Circuit Card Assembly, Radiation Testing, Component Up-screening and Packaging). Cobham Semiconductor Solutions’ Colorado Springs site is a supplier of semicustom and standard VLSI circuits and custom circuit card assemblies. They have a Qualified Manufacturer List (QML) certification for Class Q, Class T and Class V.
MRAM’s are solid-state non-volatile magnetic storage devices in which each bit of data is stored an a small, elongated magnetoresistive sandwich element. A typical magnetoresistive (MR) sandwich consists of two magnetic layers of different coercivity, one hard and one soft. The second ExoMars mission will involve a Russian-led surface platform and a European-led rover, to be launched on a Proton from Baikonur in 2020. The successful implementation of both ExoMars missions will allow Russia and Europe to jointly validate cutting-edge technologies for Mars entry, descent, and landing, for the control of surface assets, to develop new engineering concepts and service systems that can be used by other Solar System exploration missions, and to carry out novel science at Mars.